Commonwealth Games gold medallist Darren Burnett survived a tough test against fellow Scotsman Wayne Hogg at the Scottish International Open. Burnett moved into the quarter-finals by beating the Fifer, who is the latest Scot in the world's top 16, 10-6 8-4. 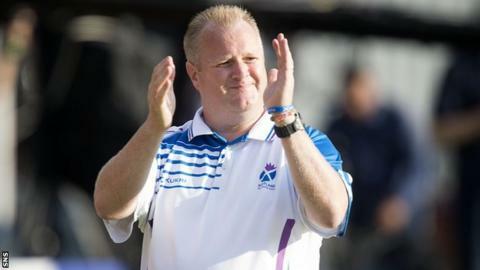 The event in Perth had already witnessed the exit of double Games gold medallist Alex Marshall. Marshall, who is world number four, suffered a surprise 12-6 2-13 2-1 defeat by England's Duncan Christie. Christie came close to another upset but subsequently missed out on the quarter-finals as world number 21 Les Gillet secured a 8-9 11-1 2-0 victory. Gillet had himself overcome the rankings in the previous round by knocking out fellow Englishman Simon Skelton, presently ranked 15. But Mark Dawes has proved the biggest giant killer of the tournament so far - following up his win over fellow Englishman and sixth seed Mervyn King by defeating Ireland's Jonathan Ross, the world number 13, 7-6 8-4. Former world champion Greg Harlow, the world number nine, was another first-round casualty, with unseeded 21-year-old Australian Mac McLean prevailing 6-5 1-11 2-0. However, England's world number two, Rob Paxton, reached the quarter-finals by defeating John Price of Wales 11-1 5-7 2-0. Defending champion Nick Brett has reached the second round following the Englishman's 14-3 10-6 win over New Zealand qualifier Rob Ashton. World number one Paul Foster, last year's runner-up, edged out fellow Scotsman Ronnie Duncan 6-7 10-3 2-0. Former world champion David Gourlay survived a scare before beating Robin Chok of Hong Kong 7-8 9-6 2-0. Fellow Scotsman Stewart Anderson, the eighth seed, edged out Englishman Ben Sherwen 6-6 9-3. Another seed to exit early was 17th-ranked Welshman Robert Weale, although he was the first-round victim of seventh-seeded Burnett, who won 11-5 3-10 2-1.